I have often wondered how the Coo-ees ended up with a fox cub as a mascot on the Coo-ee March. This is described in the following article, along with the ‘patriotic songs’ sung by the school children at Evan’s Plains. School children often took part in welcoming and entertaining the Coo-ees at each town and village visited on the march. It is interesting to note that the Coo-ees were expecting to reinforce the Australian men fighting at Gallipoli when they signed up on the Coo-ee March, not the Western Front. Transcript of an article titled ‘At Evans Plains” published in the Bathurst newspaper National Advocate on 30 October 1915, p. 3. There is no account of this day in The Farmer and Settler reports, as it was a rest day on the march. Following is an account which includes this day in a letter from Mr. H. T. Blackett, from Dubbo, to his wife, who accompanied the march in his Ford motor car. Note that there does not appear to be any surviving copies of the ‘moving picture’ film taken of the Coo-ees that is mentioned in it. Transcription of an article titled ‘The “Coo-ees” : a day by day account’, from The Dubbo Liberal and Macquarie Advocate, 2 November 1915, p. 3. ”After leaving Millthorpe,” he says, we made for Blayney, and when within two miles of that town we were met by Captain Eade, who took command of the men, and is still with us. He is a fine soldier, and is enforcing discipline very rigidly, especially in regard to drink. We had a great time at Blayney. I stayed with Mr. and Mrs. Arthur Heane, and enjoyed a good rest, feeling a bit tired, as I am going pretty solidly. What with transport, sick men, advance and rear work, I have covered over 700 miles. The Blayney people bought all our requirements. The night after leaving Blayney we camped at Bathampton wool-shed. Mr. Gilmour, the owner of the station (which is a pretty place, with lovely house and gardens), invited Major Wynne, Captain Eade and myself to stay with him for the night. He is a bachelor, but most hospitable and attentive. Next morning I went to Bathurst and brought the mails back to our midday camp at Evans’ Plains. I had a good load of stuff, besides sick men. The procession into Bathurst was one of the finest seen. Hundreds of children were in fancy dress, mounted police, Mayor and aldermen, wounded soldiers, cadets, and people by the thousands. The march to Bathurst was most imposing, and a moving picture was taken. If it is on at Dubbo you should see it. Ask the picture men to let you know if any of the “Coo-ee” pictures are to be shown. We left Bathurst, and had mid-day rest at Glanmire. After that we went to Yetholme, and camped at the school, having meals in the big dining room at “Brooklands,” and a camp-fire concert. Four recruits joined here. We left Yetholme yesterday morning, and did 20 miles to Wallerawang, where we arrived yesterday afternoon, after camping at Meadow Flat for lunch. The Wallerawang and Portland people met us by hundreds three miles from ‘Wang, and a band headed a very long procession all the way to the town. The people here are supplying all meals. Last night Mr. Carmichael addressed a meeting here, and we got seven recruits. We are now about 170 strong. 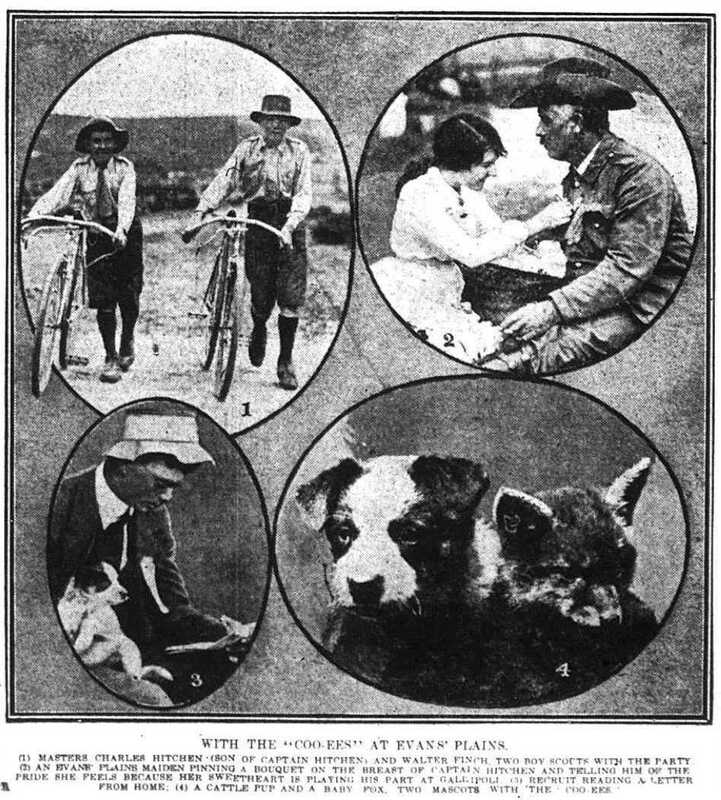 Transcription of an article titled ‘The Great Route March : the tremendous Bathurst welcome’ from The Farmer and Settler, 2 November, 1915, p. 3, [part 1 of 3]. 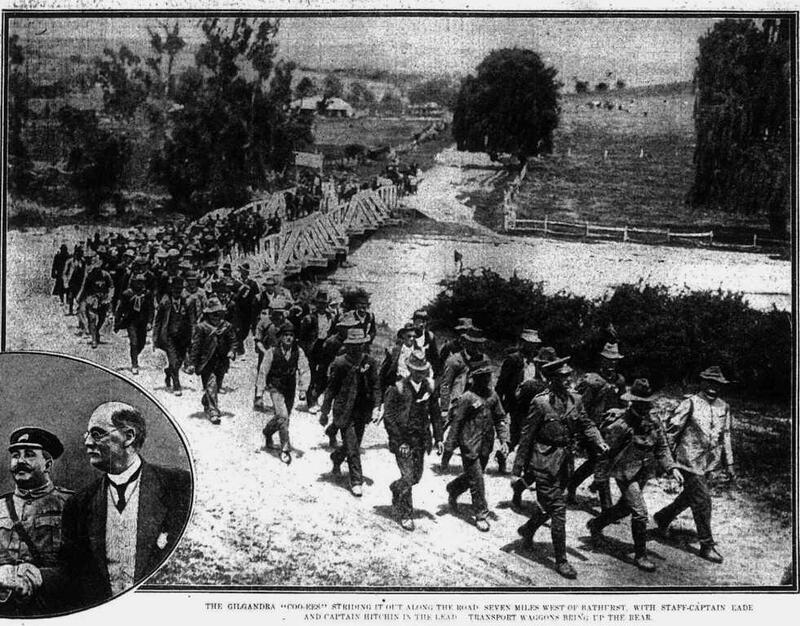 The recruiting march from Gilgandra to the sea has now reached the Blue Mountains, and is entering upon its fourth week. Captain Eade, of Lithgow, who has lately had disciplinary charge of the men, has done much towards making an army out of a mob, and by the time the column marches into Sydney it will be of a strength and of a character that the defence authorities will gladly approve. After leaving Bathampton on Thursday morning dinner was provided for the marching column at Evans’ Plains, and the march then continued to Bathurst. The pre-arranged time of arrival at the outskirts of the town was four o’clock, so, as good time had been made on the journey, an hour or more was put in at squad drill. The preparations of the Bathurst Recruiting Committee were elaborate and complete in every particular. All Bathurst was out to do honor to the men from the Castlereagh, and the children of all schools made a remarkable display, dressed in the costumes of the Allied nations. The cadets, under Col. Paul, and the school children lined the road, and then a procession was formed. Mounted police led, followed by the mayor and aldermen, and the Salvation Army and City Bands; a party of returned wounded soldiers, enjoying a holiday as guests of the Bathurst Red Cross Society, headed the “Coo-ees,” and the Bathurst unit fell in behind with their banner. Hundreds of people lined the route, and the mile-long procession wound its way along the gaily decorated streets amid the cheers of the onlookers, and the ringing of church bells to King’s Parade, where an enclosure had been made in front of tho Soldiers’ Monument. The wind had been rising all day, and at half-past four, just as the procession was turning into King’s Parade a “southerly buster” swirled the dust in clouds around the marching men. Alderman Beavis, Mayor of Bathurst, briefly welcomed Captain Hitchen and his coo-ees, for whom rousing cheers were given; then, as rain seemed imminent, the ladies dispensed afternoon tea and cigarettes in All Saints’ school-room, instead of outside as had been previously arranged. The camp for the night was at the show ground, where also the ladies, marshalled by the Mayoress, served dinner to the hungry “Coo-ees.” Fortunately the weather cleared, so that no more alterations to the programme were necessary. At 7.30 a continental was opened in Machattie Park, the selections by the District and City Bands being interspersed with recruiting speeches. A more beautiful setting could not have been found anywhere than in this park, with its well ordered paths, trim greenery, and the lights from the band rotunda glistening on the water playing from the fountain, about which the great crowd had assembled. Sweets and tobacco stalls were dotted about, at which purchases might be made by all except “Coo-ees,” who had been provided with badges that franked them to everything inside the park gates. Supper was served by another staff of ladies in a large tent specially erected for the occasion. The Mayor, as chairman, introduced Dr. Machattie, Captain Eade, Sergeant Lee, and Private Fern, M.L.A., the member for Cobar, who was going to Cobar that night on final leave, and also to bring down a hundred men from the farthest west to join the column at Penrith.